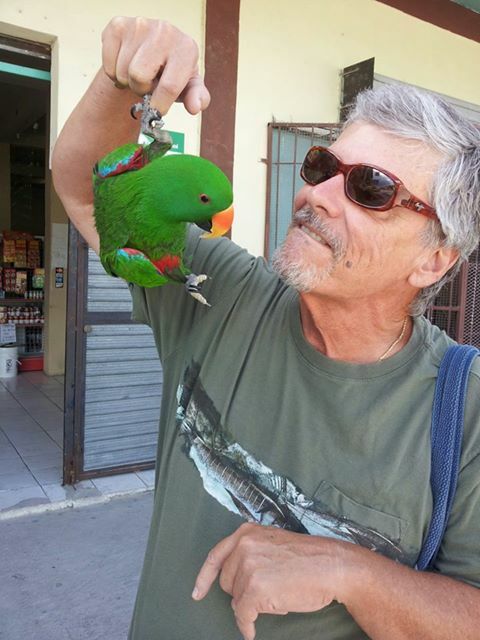 Jimmy Buffet’s Parrot Heads got nuttin’ on me: With Harry the fellow American expat and movie actor from Hollywood. You meet the most interesting birds in Belize. This is the fourth in a week-long series of “Noon Wine” reflections on scriptures on the poor and poverty. 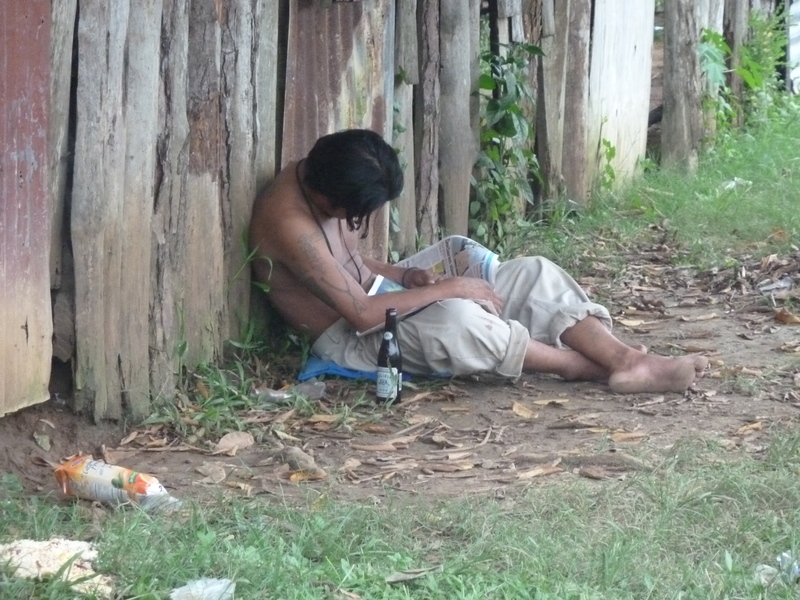 This is the fourth in a week-long series of “Noon Wine” reflections on the poor and poverty. “Do not confine your conversation to gentle and elegant people. I should like [to do that] as well as you do. But I cannot discover a precedent for it in the life of our Lord, or any of his Apostles. 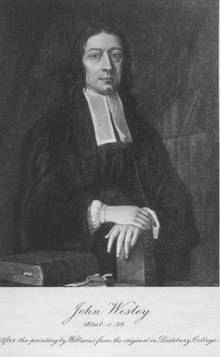 John Wesley: To heck with all the muck and mire, the dirt and disgust in serving the sometimes ungrateful poor. Jesus expects no less than getting down and dirty with the poor. That’s a cost of discipleship. Being materially poor and wealthy doesn’t automatically make a fellow child of God more noble, more virtuous or more saintly than any fellow child of God who happens to be materially wealthy and powerful. The poor, the homeless, the needy, can be just as ignoble, obnoxious, manipulative, god-awful and hard to like, much less to love, as the rich are, as you are, as I am, as any child of God is. Be that as it may, Jesus reminded us at every turn that God cares about and for the poor and the powerless because the poor are vulnerable to those who got the mammon. Because those who got the mammon wield all the power, like a hammer, over the poor and vulnerable. 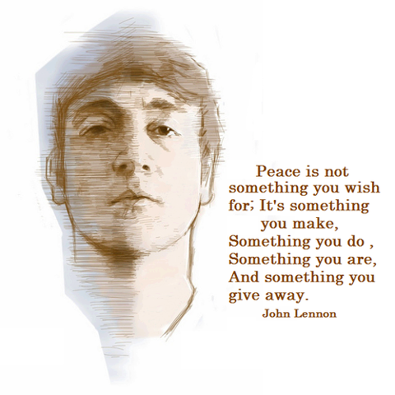 And the love of mammon and the power that goes with mammon leads to so much of the world’s evil. John Wesley, that lifelong Anglican priest and co-founder of the Methodist Movement that morphed into the socially conscious Methodist Church, was a workaholic. He worked obsessively not only crafting all those sermons and the tracts that made him, by today’s money, a multi-millionaire, but also worked at pouring money into alleviating the horrendous poverty in his British homeland. 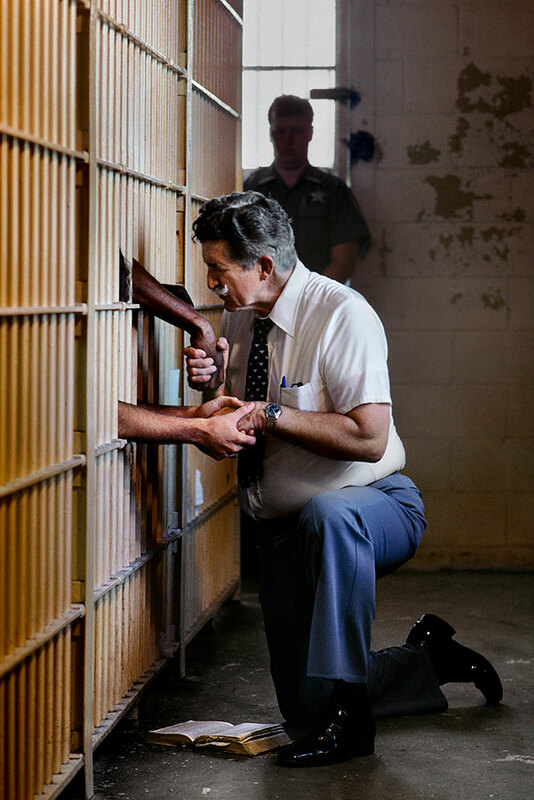 At the end of his long, happy and productive life–a life that reformed the whole of Christianity–he’d given away all that money he’d made in service, largely, to the poor people that he loved as Christ loved the poor and the living Christ loves the poor. We’re called to love the poor no less. Wesley and most of the others of what I always describe as my faith heroes–Dorothy Day, St. Francis, Mother Teresa, Dietrich Bonhoeffer, MLK Jr., Albert Schweitzer and others–kept the entire focus of their lives on loving, lifting up and fighting for justice for the poor and powerless. These “heroes” and saints helped and advocated for the poor with the same intensity with which Jesus kept his face pointed and his legs moving toward Jerusalem. It was the same kind of intense determination that gave Paul and the Apostles the drive and determination to help the poor at every turn. But loving the poor wasn’t especially easy even for my heroes. 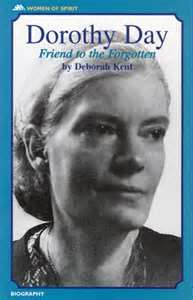 Dorothy Day was constantly quoting Father Zosima from the great literary work “The Grand Inquisitor.” The Russian Orthodox priest was talking to a woman who feared that if she got down and dirty in helping the poor, the poor would just be ungrateful. One of Day’s spiritual heroes was John Wesley. She read and absorbed Wesley’s sermons upon her conversion to Christianity and the Catholic Church. “Do not confine your conversation to gentle and elegant people. 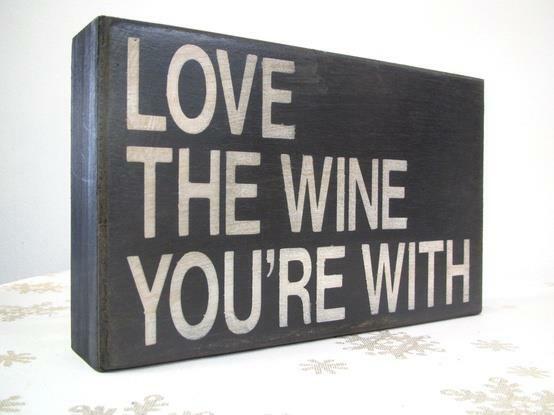 “I should like this as well as you do. But I cannot discover a precedent for it in the life of our Lord, or any of his Apostles. “My dear friend, let you and I walk as he walked … I want you to converse more, abundantly more, with the poorest of the people, who, if they have not taste, have souls, which you may forward on their way to heaven. 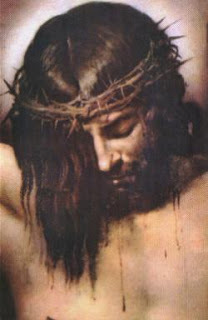 “And they have (many of them) faith, and the love of God in a larger measure than any persons I know. 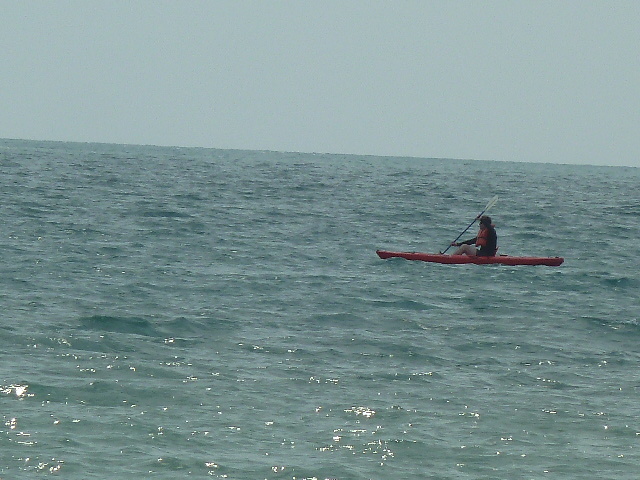 “Creep in among these, in spite of dirt, and a hundred disgusting circumstances; and thus put off the gentlewoman. — From John Wesley’s “Letter to ‘A Member of the Society,’ February 7, 1776, Works 12: 301. I like–“high church worship services” like you get at Anglican Churches like St. Andrews Anglican Church were I usually attend church. 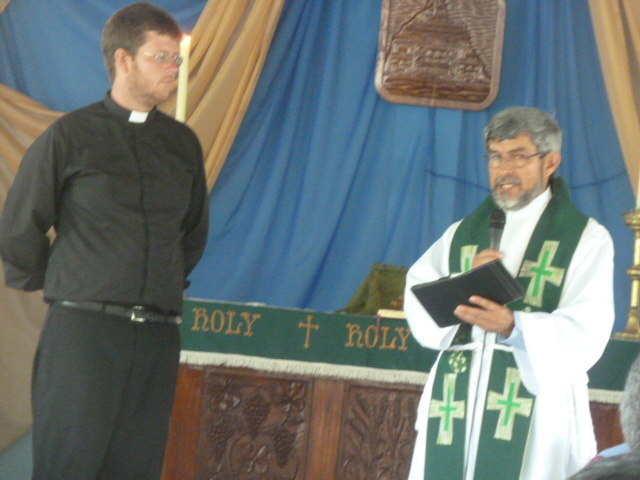 Father Juan, on the right, is originally from Colombia but is now the rector at the dynamic St. Andrews. And my good young friend with the razor-sharp wit Father David (left), who grew up in Indiana and ended up an Anglican in San Diego and then in Colombia by way of Oxford University (did I mention he’s very smart?) is also at St. Andrews here. 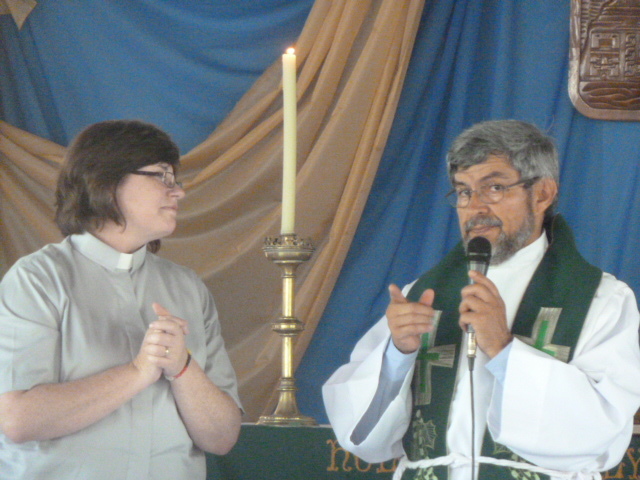 We also had a mission team visiting today from Pittsburgh led by another talented young Anglican priest, Mother Elaine. Among things I like–to see young clergy with gifts and graces and talents and smarts and leadership skills and good humor coming up in the church universal. 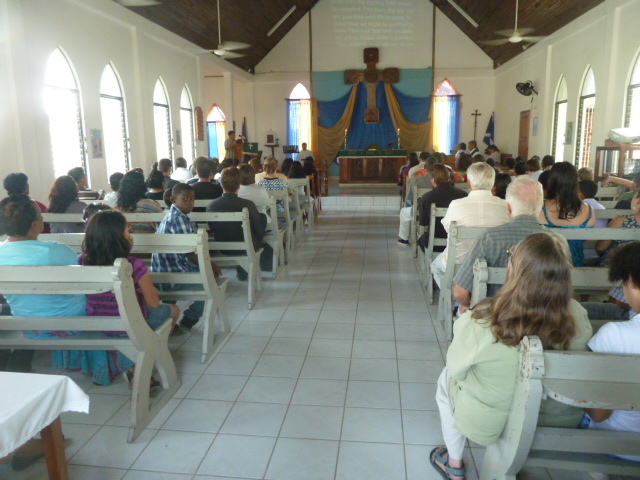 Big crowd where I worshipped with those “high church” Anglicans in San Ignacio on a beautiful Sunday morning. 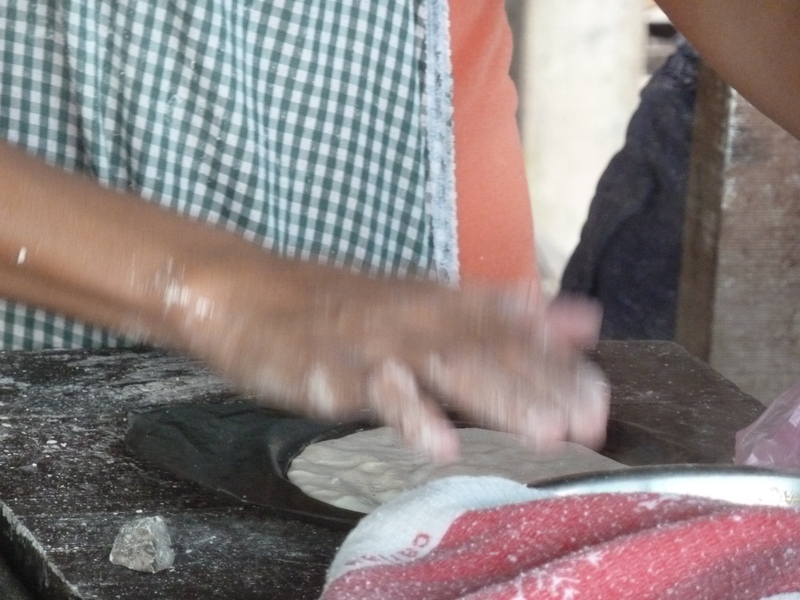 St. Andrews typically has a lot of us American expats, tourists and visitors passing through town but mostly local and very faithful Belizeans. Many years ago, two of the elderly church-member women kept the church going without a rector. 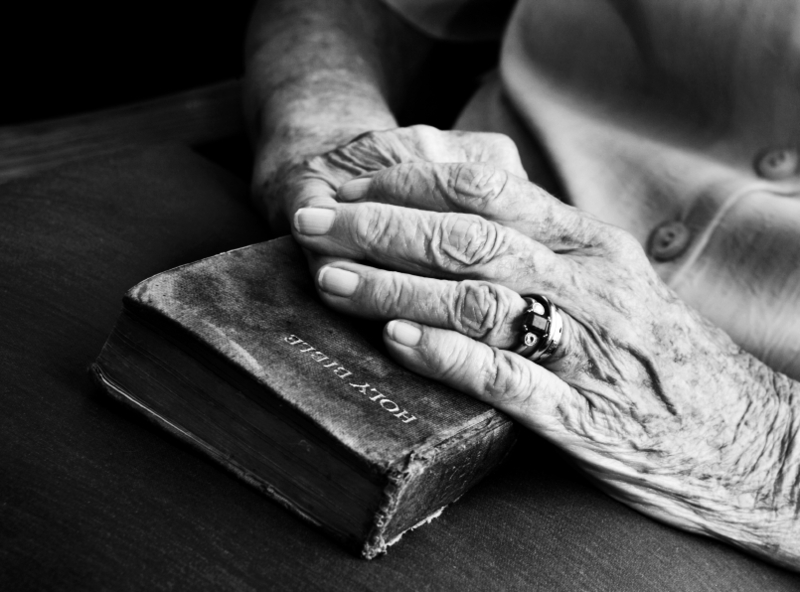 They are amazing church mothers, elderly lay Christians who refused to let this church die. 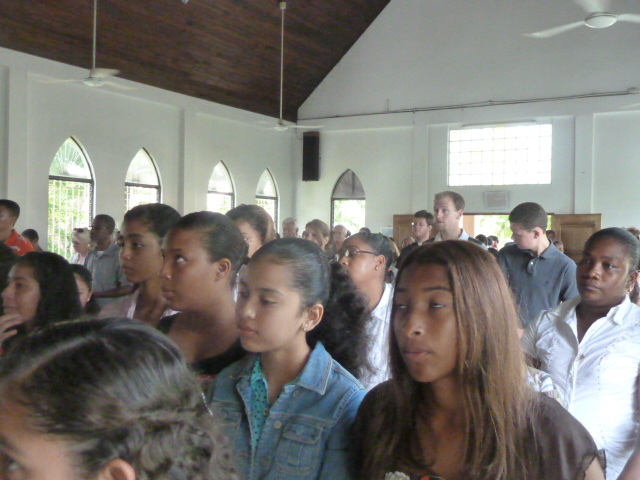 It’s now one of the most dynamic and vibrant churches in western Belize, operating one of the best schools in the West. View of St. Andrews from the altar. Kids graduating from the St. Andrews primary school got front-row seats this morning. 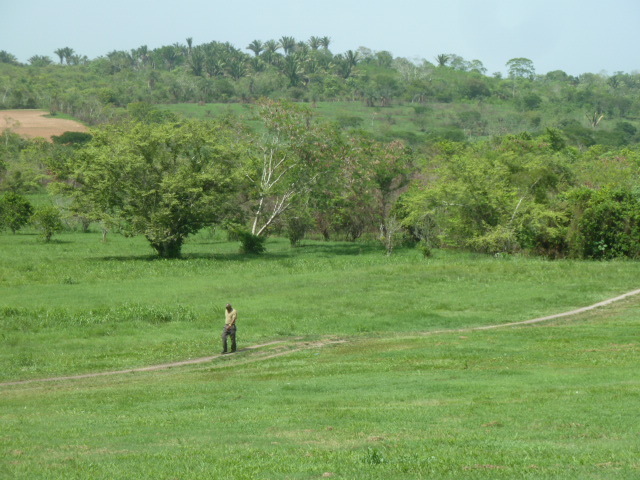 I like: riding my red motorcycle (“Rojo”) around western Belize’s kazilion rural roads, where I happen across scenic little farms like this one. 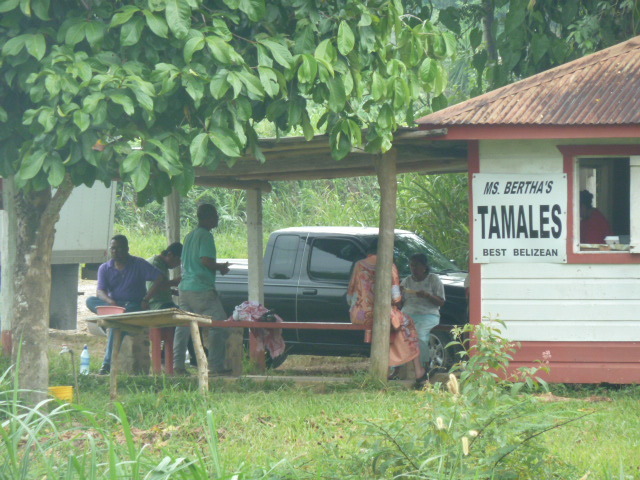 I like meeting Belizean farmers like the brothers who have this place who were under a shade tree drinking some beer and just gabbing and enjoying their Sunday when I mosied over and met them. I like long walks, just to see what’s over the next hill, around the next bend, along the next little trail into the bush. Fewer things feel more spiritual and holy to me than an aimless walk, and not necessarily in the country. A city, a town, a village–the spirituality in it is just letting myself be free and open to whatever is down the country trail or the city sidewalk. I like–being living close to ancient Mayan ruins and Mayan culture and because I love learning you can live forever and learn fascinating stuff about that mysterious Mayan civilization, such as it was. They could be a most uncivilized lot toward one another sometimes, one reason for their abrupt demise. 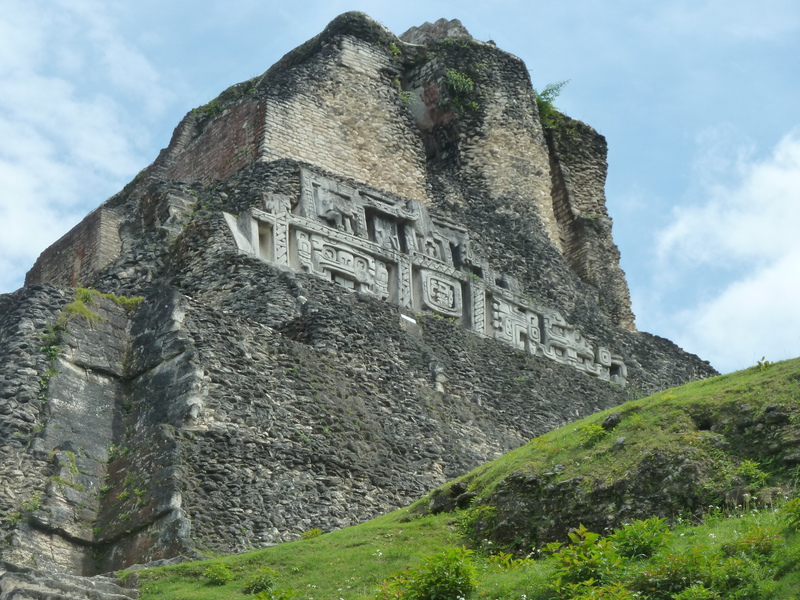 The is “El Castillo,” the landmark at Xunantunich in Succotz Village where I lived for six months. Talk about a cool place for long walks . . . . 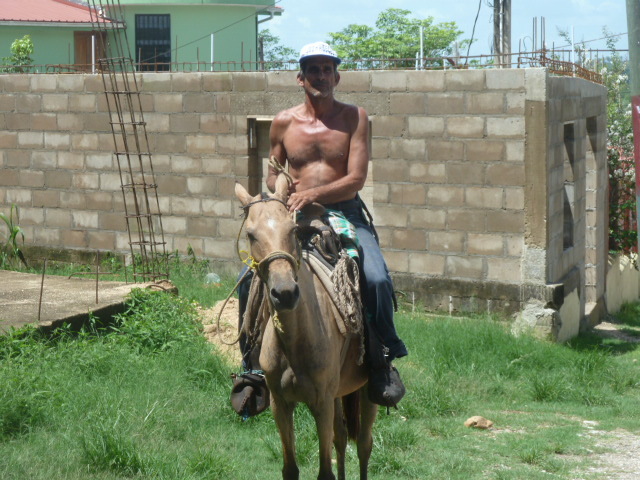 I like horses and riders, and there’s a plenty of them to remind me of Texas in a country as rural and rustic as Belize. 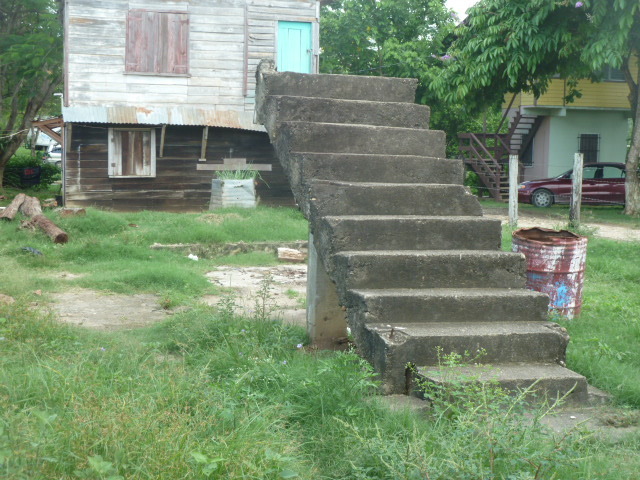 Belize is actually a lot like the 1950s rural and still rustic Texas that I grew up in. I like to come up on another roadside attraction of the sort that I can just never resist, like these little eateries where I like to stop and hang out out and eat too much and drink the sodas they bring to you in the big soda bottles, always with a straw in them, and listen to the locals gabbing. Sometimes I get strange looks, btw, when I take the straw out of my soda and drink out of the bottle. Found this place riding down the scenic Hummingbird Highway that goes from the capital city of Belmopan south to the Southern Highway that goes south to the southern Caribbean seas. 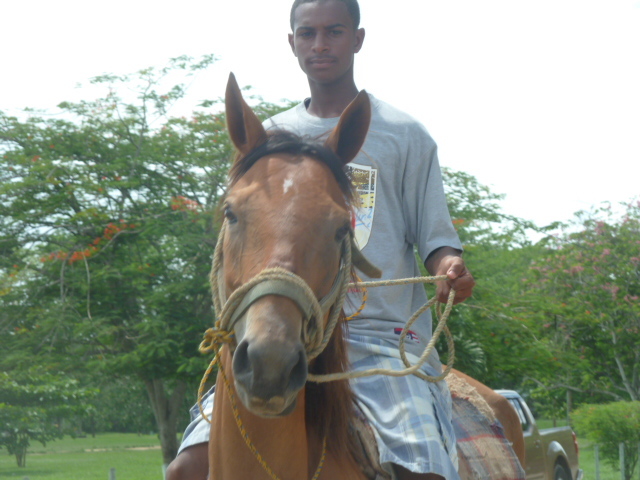 Did I mention all the horses and riders there are in Belize? If you like rural and rustic . 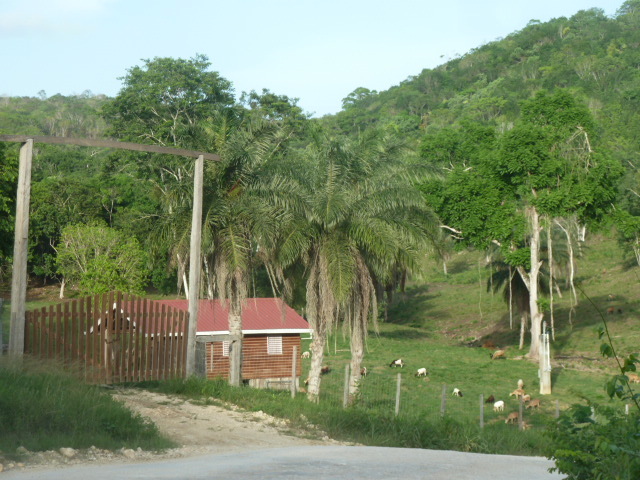 . . come to the Wild West of Belize, as they call it. 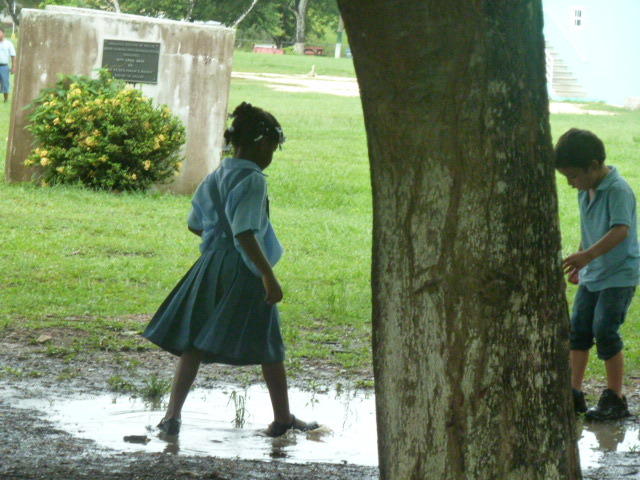 I like how free-spirited the school kids of Belize are, like these on the wet playground of a Catholic school I walked by in Belmopan the capital last week. Go ahead and stomp your shoes in that mud real good, guys. It’s good to be a kid! And a few more things I like, and like a lot, in the stream of consciousness manner of Sontag: Floppy bibles, St. Francis, Shiner Bock, barefoot women, libraries, wooden pews that creak, watching football, full moons, dark bars, taking photographs, Pope Francis, shrimp, long walks, Thomas Merton, hot sun, shade, history, tradition, rock n roll, indie movies, running, Mark Twain, water from a hose, barns, architecture, cows, target shooting, riversides, real tomatoes, going barefoot, small towns, big cities, the Lord’s Supper, Dorothy Day, candlelight, Spanish, dark-bar music, Wesleyan hymns, “The Letter From Birmingham Jail,” city life, country life, authentic people, “Hotel California,” St. Theresa of Avila, large full moons, Catholic sanctuaries, Oscar Romero, President Eisenhower, pubs, Letterman. 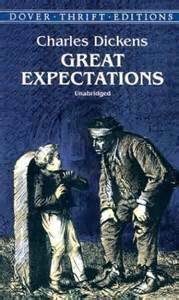 If there’s three books I like and always will (the bible notwithstanding) it’s “Too Kill a Mockingbird,” “Huck Finn” and “Great Expectations.” Maybe the only three I’ve read at least three times in my life, and will probably read again. I like em. I like em a lot. 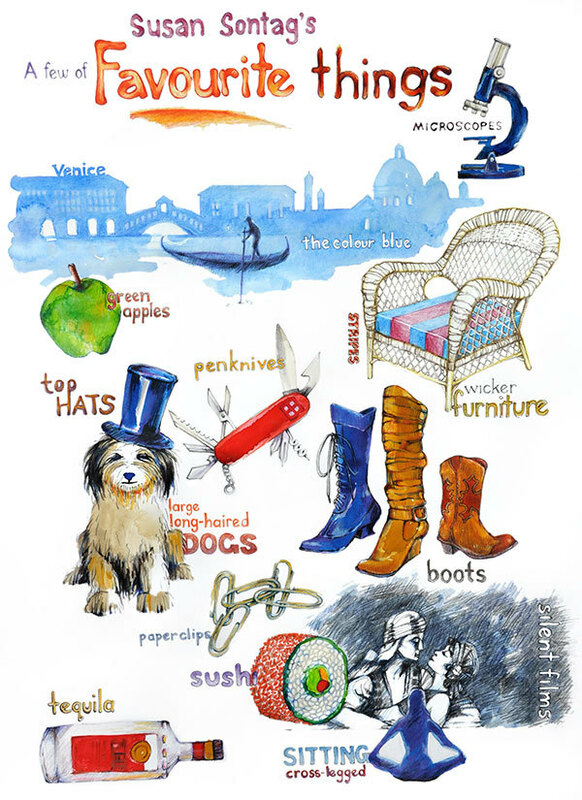 And still more things I like, and like a good bit: Walking barefoot, Rabbi Heschel, deep breathing, classic theology, country people, campfire, green grass, Dickens, stand-up comedy, Larry McMurtry, Sgt. Pepper, pipe organs, C.S. Lewis, country churches, “The Simpsons,” “Taps,” the Dalai Lama, St. John of the Cross, sometimes some Mozart and sometimes some mean ol’ Mick Jagger song. And there’s still more I like that I could list, and I probably will list. So try pouring out your own simple pleasures at times, occasionally stopping to reflect on why you like something you like something. It can help to get clarity in defining yourself, finding the authentic you and being who you are in this world. And Lord knows there’s enough control freaks or conformists in the world who want to define us, to diminish us with labels they think are fitting for us, to make us fit into their own image of themselves. They will, if we let them, rob us of that personal quality that Jesus insisted on–that quality of authenticity, the true me, the true you too, that God created. And granted, God created us in God’s own (moral) image, but also gave us the freedom to find our own, honest-to-God hearts and passions in order to receive the gift of “the life more abundant” of which Jesus spoke. I also love dogs, cats and even sometimes bugs, I also like the earth I mean if trees can grow back limbs and stuff then why can’t the earth have a few secrets? 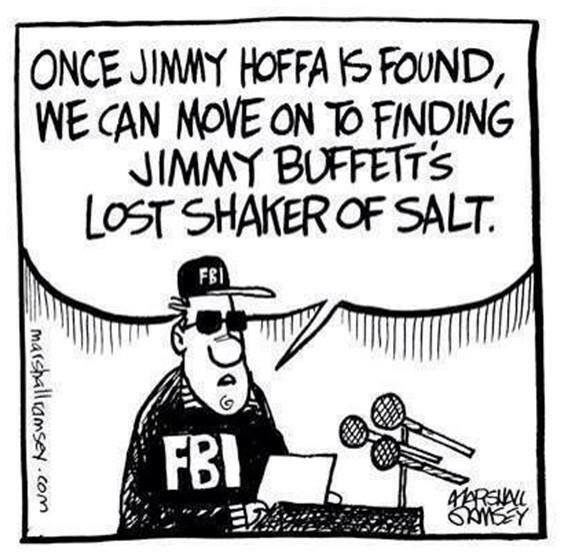 It would only be fair if it did. Chaa Creek Lodge is one of Belize’s first-class eco resorts, located deep in an Eden-like rainforest setting a few miles down the road from home here in San Ignacio/Santa Elena. 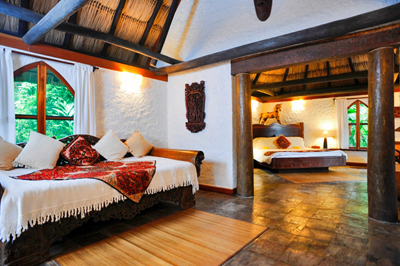 Gorgeous room at the gorgeous Chaa Creek Lodge, one of the world’s top-ranked eco resorts. they give back an enormous amount to Belize and her people–including the kids at the summer Eco Kid Camp. Belize has been good to Chaa Creek and its owners Mick and Lucy Fleming, but Chaa Creek and the Flemings are very good to Belize. As noted on its web site (click here), ten percent of all its room revenue goes directly into environmental, educational and community programs, and in supporting worthy groups and causes. I have almost always wanted to grow something. It did not matter what when I was younger I would plant a lot of seeds that I found. I also would like going around and asking my mom if she could spare a carrot top or a potato’s eye or a sweet peppers seed. I would plant everything that I got and I would check them every morning, I would water the small plants but most all of my attempts failed. I still want to grow plants. Another thing is trees I mean if you look at a tree closely there are so many different ants and bugs on it and almost every single one has a home in that same tree. One other cool thing about trees is that trees can be cut in half and the tree can grow right back. Another thing I love is birds although some black birds can be annoying. Sometimes I look for them but I mainly find parrots. Another thing that I have been finding is toucans, the point is I like to watch birds. I would love to know some stuff about plants, bug’s, animals, and of course the cool brown earth and all that good stuff. I also like flowers and all their colors and all the variety that Belize has is… well it’s super cool. And nature makes me wonder, what is nature? what does it really actually mean? Do humans even know or do I know? I am pretty sure I don’t but I sure would like to know more. All of the things that happen all over the earth it’s not just in certain places that are interesting it is everywhere.